I actually first posted about a pasta recipe with a creamy, eggy lemon sauce the first week this blog was live, back in 2009. The recipe was inspired by one by Dave Lieberman, whose boy-next-door good looks, and proclivity for challah bread pudding and stuffed cabbage caught my attention when he was briefly on Food Network, hosting his fantastic show, which focused on fresh, affordable, simple foods, Good Deal with Dave Lieberman. When the San Francisco-based pasta company, Three Bridges sent me some fresh pappardelle (a wide, tender noodle), I knew I had to break it out again. 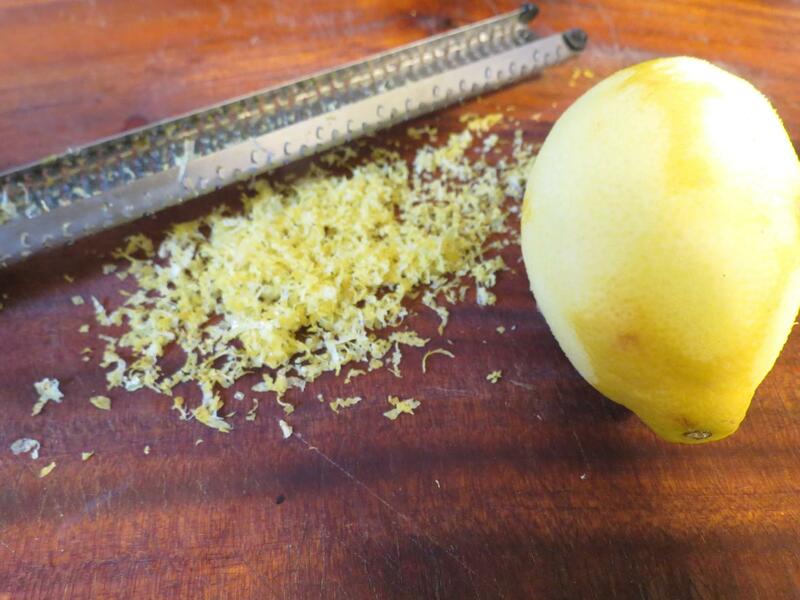 The key to getting really rich, lemony flavor is a one-two punch of both lemon juice and lemon zest. Though there is a little bit of technique involved, the dish is actually pretty simple. The main work is in whisking the sauce, which is cooked over boiling water, so the eggs cook gently with the half-and-half and lemon without scrambling. If you have a double boiler, this is a great time to use it, but if, like me, you don't, just make your own with a bowl and a pot. All that whisking really pays off though, because the sauce is utterly decadent. 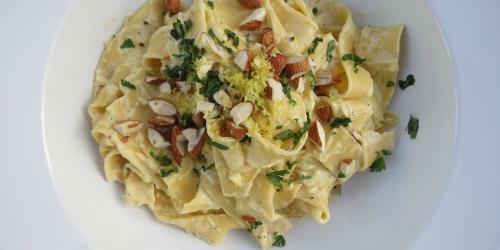 I top the sauced pasta with more lemon zest, plus parsley and coarsely chopped, lightly toasted almonds for crunch. Serve this with a crisp green salad and Prosecco or another crisp white wine. Combine the egg yolks, half-and-half, garlic, lemon zest, lemon juice, and salt and pepper to taste in a heatproof bowl (or in the top of a double boiler). Place over a pot of boiling water (check out the photo in the introduction to get a sense of how this should look--make sure the bowl is large enough to sit on top of the pot without falling in). 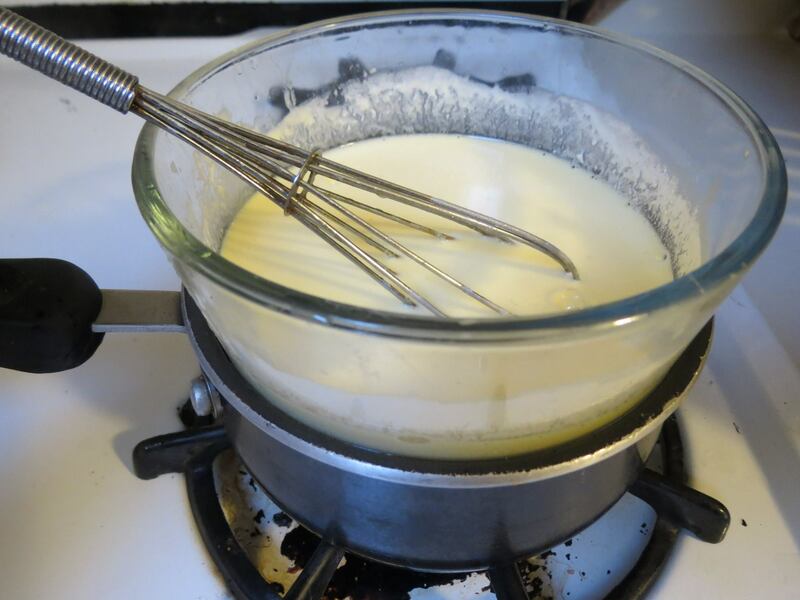 Whisk until the mixture thickens into a pale yellow, smooth sauce (depending on the size of your bowl, this could take anywhere from 3 to 7 minutes). Remove the sauce from heat and set aside. In a large pot of boiling salted water, cook the pappardelle according to directions. As soon as the pappardelle is cooked, toss it with the sauce. 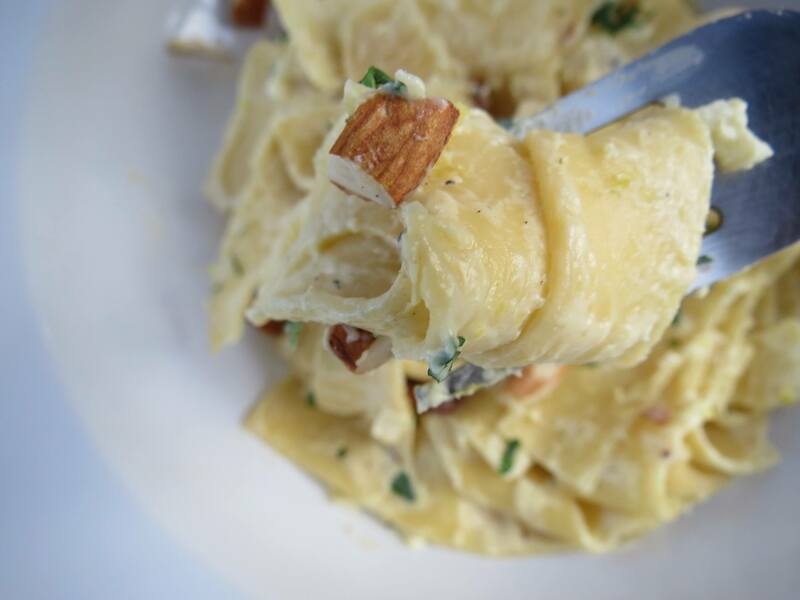 Use tongs or forks to divide the pasta into bowls and top each one with a sprinkling of almonds, parsley, and more black pepper if desired. Looks delicious and healthy! I’m sold! this is the link that is made for specially generating free codes of steam wallet. your piece of writing and dishes is really awesome i try your dishes and make new yummy dishes every day thanks admin..
You can simply provide good material and published at the right time. Thanks for sharing this best stuff with us! Keep sharing!I have been following your blog for some time now and have found it quite informative and also interesting and you have very nice way of expressing the article.Looking forward to another article. even a year before who can believe that you can have your own generator for itunes gift card and now there are website that can offer you codes and cards. Learning everyday! This is a very high quality post on this platform and putting up for my work. Thank you so much for this wonderful article. I really liked your way of representing the foods. Kids always like to have decorated foods. but if, like me, you don’t, just make your own with a bowl and a pot. Hello everyone, here are glad to introduce you with our escorts in Sydney and escorts in Perth who are providing world class entertainment services at lowest rates, in cause if you are in India then kind have a look at escorts Gurgaon and call girls Jaipur who also are offering the same services at the most affordable rates. Your article is nice. All the dishes are looking good. Hmmmmm, Your blog is very popular! This paper content rich and colorful, adopt unique writing thinking.I think they will like to see this article. Howdy, I think your site may have program similarity issues. When I take a gander at your blog website page in Safari, it looks fine however when opening in Internet Explorer.It makes them cover. I just expected to give you an energetic heads up! Other then that, surprising post. are very much bold and educated and they are all highly seducing in arrived from head to heels to you which enable all the perfection on your sexual lust to get to love with on demand and we are all happy to meet your all search completed at low rates on demand. I think that it was quiet awesome, in a faultless world you will keep improving such objectives… .Keep analyzing. I’m back to this nice article, Thanks for sharing and keep sharing. High class female escorts in Kalkaji for fun. We are the top escorts provider in South Delhi, available 24*7. The perfect recipe which I love the most. Thanks a lot sir for this kind article about the fascinating recipe. Love your tip. •	I totally understand what you are writing about and I appreciate it. Yeah, that is looking really very delicious – escorts Jaipur | Udaipur call girls thanks. I really loved reading your blog. It was very well authored and easy to understand. Unlike additional blogs I have read which really not tht are good. I also found your posts very interesting. In fact after reading, I had to go show it to my friend and he enjoyed it as well! Thanks for the info keep posting more about this. really health is God great Blessing.thanks admin! is it expesive to make it? 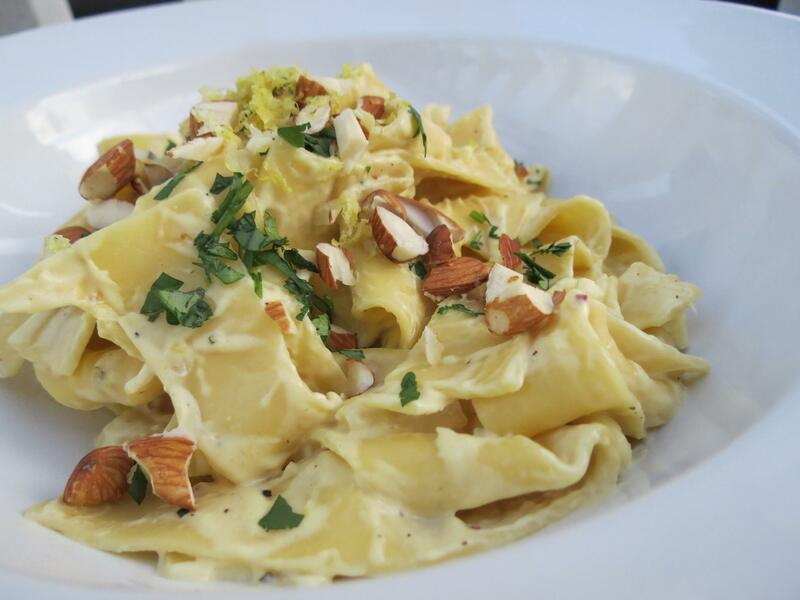 These things are the great usage of pappardelle. Great site plz open this having fun…. Most of them are independent models escorts in Kolkata and they have walked the ramp and now they do it just for gun and some extra penny. 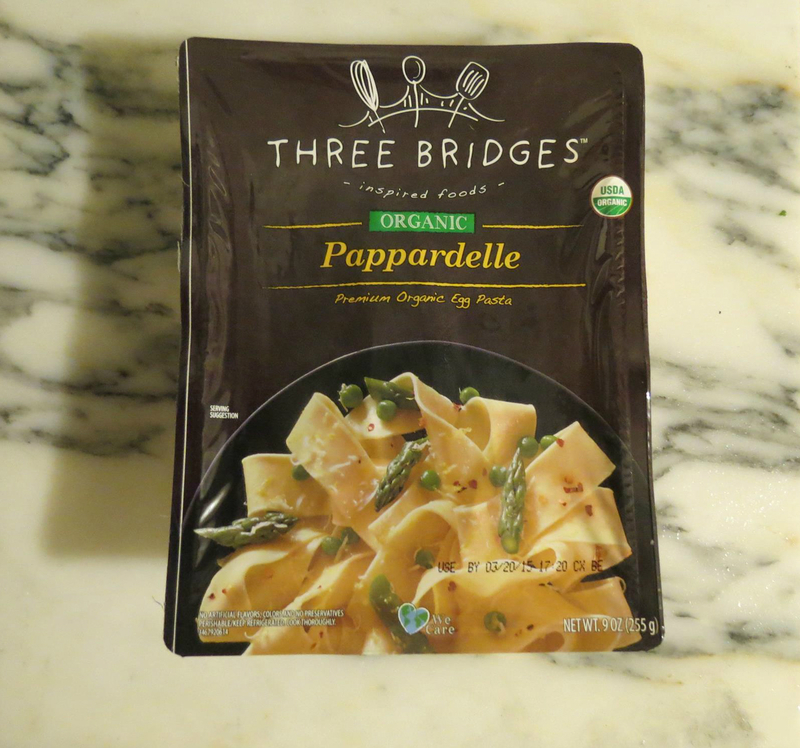 I have never tried pappardelle, I wonder if I could make that flavor right. Thank you for the recipe. I tried this it is delicious. The article is quite well written it draws attention towards it. If you are looking for best <a href=“http://www.karolbaghescortservice.com/karol-bagh-escorts-services/”>Karol Bagh Call Girls</a>. So we can help you <a href=“http://www.karolbaghescortservice.com/”>Karol Bagh Escorts</a> is one of best place for you.where you can enjoy with beautiful girls. Thanks for the post. It is really great to find an interesting item on lemon pappardalle. approximately my trouble. You are amazing! The instructions for making the sauce for your noodle are very specific, Thank you for sharing this recipe. Very Effective Post,It’s Give Me New Ideas on My Life. I would like to mention that the topic you have selected for your article is very relevant. I appreciate your intention to aware people. Panjshir Emerald also known as afghan emerald is one of the finest emeralds that is found in the Panjshir valley of Afghanistan which is known as the valley of the Five Lions. We offer cherry-picked investment grade emeralds from the world’s favorite mine located in Panjshir. Your this article is proven very very helpful for me. Tysm!! Other readers will also enjoy your blog while reading. My name is Neetu Sharma. I am a resident of Chandigarh. I was born in Chandigarh and I am 25 years old and my length is 5 feet 6 inches. My big eyes are very beautiful and my color is white like milk my body skin is soft like butter. My youth has just begun. Brother should be the right printer or All-in-One for your business uses and personal use.. Brother printers deliver best performance and include free technical support for the life of the products. Browse our full business printer suite to find the right model for your company. Feels like encaged inside your own desires. It’s kind of funny anyway when you can’t and sometimes not allowed to satisfy basic needs. You should just go and grab one you need from escorts in Gurgaon and feel way better after all.